Thank you again for sending in all your elemental magick spells. This spell was sent to me by Anonymous. Anonymous, thanks so much for sharing this spell with the website. I am sure many of you have dreams of being able to control wind. Cast you circle as you normally would. Light the candle and concentrate on the feather. As you concentrate on the repeat the incantation “Move by Wind“. You need completely focus as you try to move the object by when. Don’t concentrate on levitating the feather. That is not the correct type of energy manipulation. What you want do is focus on calling the wind to move the feather. This spell is best done in a closed off area free of any wind drafts. People have been known to snuff out their own candles with their minds! Don’t! Focus on moving the feather if you affect the flame of the candle then you are misdirecting your energy. You can also can also practice this method outside. Find a quiet place outside and focus on calling the wind to you. It is harder to distinguish from what you are doing and what is coming naturally. 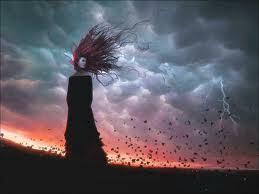 During this meditation the goal is o become one with the wind. You can practice controlling the wind by lighting your candle and trying to snuff it out with your mind. Or practice with the feather. You don’t have to light the candle every time you do this spell. This spell takes a lot of concentrate and will power. If you are trying to build your mental abilities I would suggest you subscribe to my youtube channel for FREE mental ability exercises.